Suppose for the moment you have the Ten Men loom on your hands and are ready to begin weaving. Perhaps you forget to reach for the near little finger string and instead pick up the lower near index string. This is like applying an a weave to the lower index loops rather than the little finger loops. If you then finish this “weave” and reset the loom (i.e., pick up the upper near index string, navaho the thumb loops, release the upper index loop and transfer the thumb loop to the index), you have something that resembles the original Ten Men loom. But if you inspect it carefully, you will note that the string crossings are different. What i think about this maneuver is that you have now formed a completely different loom by applying the logic of an a weave to the lower index loops. If we rename the original Ten Men loom (opening 1), then the new loom described above is appropriately named opening 2. 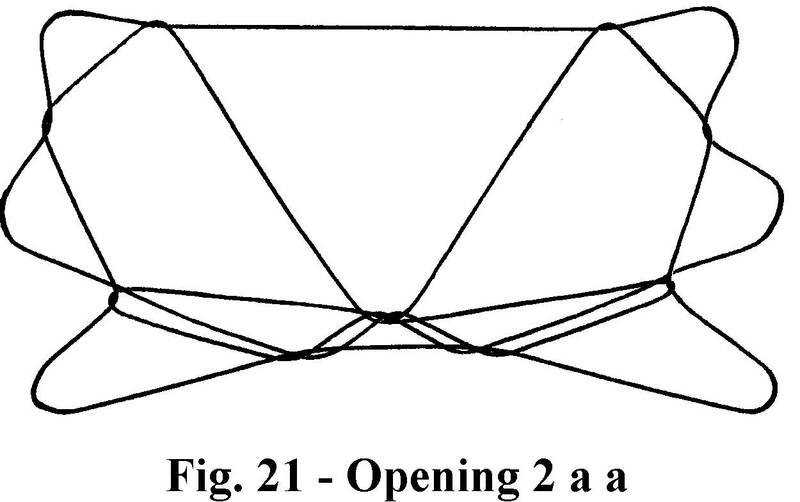 If you now form the figure opening 2 a a (fig. 21), you should see that it differs from Ten Men (opening 1 a a) because of the altered loom. As a matter of fact, you will find that opening 2 is “degenerate” in that the figures formed with it tend to collapse onto the bottom frame string and are not pulled up onto the top frame string to form a web. This is where the Universe weaves prove useful — they help lift the pattern up onto the top frame line. Two of my finest creations (Jaguar and Five-Pointed Star) appeared while attempting to “repair” an opening 2 figure using Universe weaves. In openings 2-7, you will need to finish the weave (pick up upper near index string, navaho thumbs) and reset the loom (release upper index loops, transfer thumb loops to indices) to generate the new loom. One can also create new designs by weaving only the lower index loop strings (i.e., by omitting the normal a-e’ weaving of the little finger loop strings) or by mixing lower index weaves with little finger weaves. For example, the following two-weave sequence, which uses only lower index loop (b weave on the lower index loop only, weave, reset loom, b weave on the lower index loop only, extend) gives a pleasing pattern with interlocking diamonds. Indeed, the distinction between what constitutes an alternative loom and what constitutes an alternative weave begins to blur as you continue to experiment within the Ten Men system.